This is a co-publication between Narcissus Press and Perdrix Press. 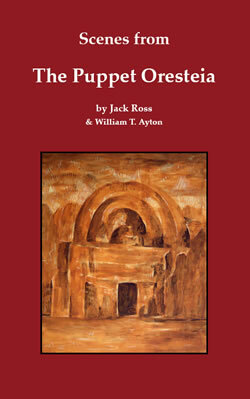 What would happen if two children decided to put on the Ancient Greek Oresteia in their own puppet theatre? With their (recently divorced) parents as characters? Casting themselves as Iphigeneia, sacrificed by her father for a favourable wind, and Orestes, the murderer of his mother? What kind of bloodbath might come out of that? This modern retelling of the classic trilogy in words and pictures is a collaboration between New Zealand poet Jack Ross and US-based British artist William T. Ayton. Cover painting is "Temple" (2004) by William T. Ayton. For more information on Jack Ross, please click here. 24 ink drawings / 44 pp, perfect bound. RRP: $US 15 / $NZ 20. Available from Lulu.com, as a print-on-demand publication, please click here. For more news and views, please see the Narcissus Press blog. Narcissus Press is a small publishing house based in upstate New York. For more information, please see the about page.